Send this Appealing Dani Georgette Printed Saree in Off White and Pink Colour to your beloved one as a gift and show your affection. 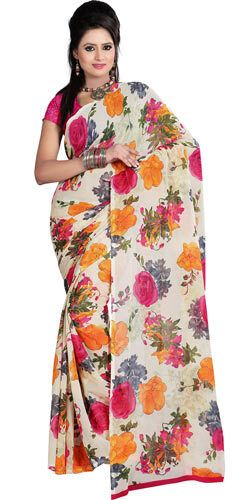 This Off White and Pink coloured Georgette Printed Saree is decked with tropical floral prints. These alluring colours and features make this Saree much more appealing and attractive.